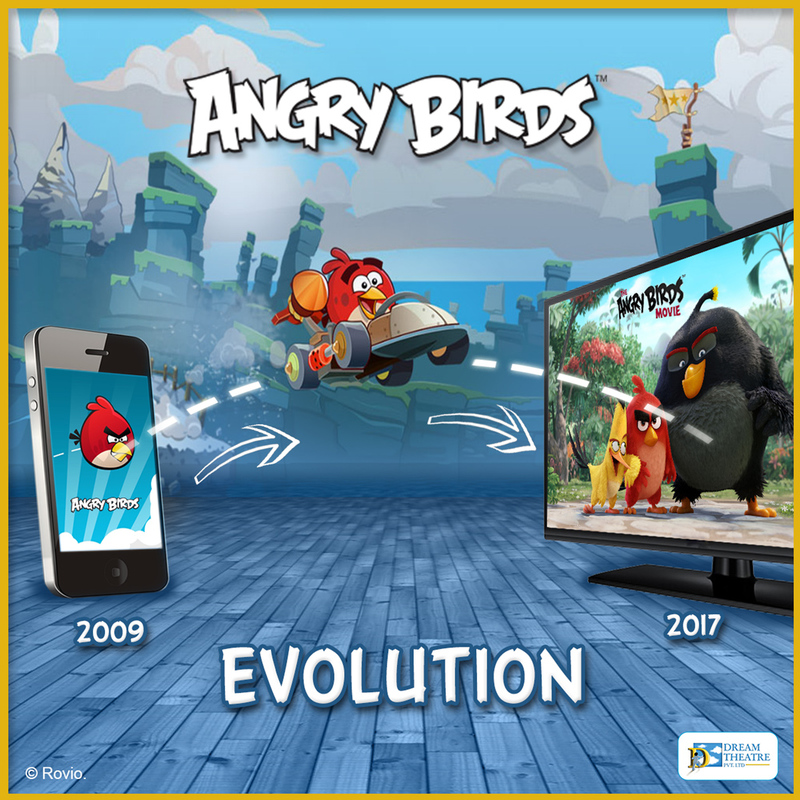 As proud and passionate representatives of the brand in India and South Asia, we never stop being amazed by the journey that the Angry Birds have undertaken and how far they have come in a very short period of 6.5 years. From a game launched in December 2009, Rovio has reported revenues of US$ 200 million in 2016 and has had two rapid growth quarters in the first half of this year for Angry Birds. This has come on the back of 3.5 billion game downloads, 6 billion video views on Toons TV, 2 billion video views on YouTube, having 300 licensees and a 130 promotion partner, generating 250 million US$ in BO revenues and being the No.1 movie in 51 countries. What started as a game is now a thriving global entertainment franchise with content, movies, consumer products, publishing, location based entertainment and more! Now that is what we call journey worth emulating! So what is it that Angry Birds has or done that makes it so special? First off, as Kati Levoranta, CEO of Rovio puts it, is the passion for the character and storytelling. According to us, that’s what sets them apart, the devotion to perfection, the detailing and the depth and richness of content – that’s what the audience reacts to and loves. The second thing we believe is creating stunning, world class products from gaming to movies and content. Each time they launched a new game, the team poured their heart and soul into the product and partnered with the best in class. Angry Birds Space was built in association with NASA. The movie was 4 years in the making and helmed by the best talent from across the world. The licensing story has a similar arc – it is the most successful licensing program from a mobile game background with millions of products across its 430+ strong global base of licensees and partners. Thirdly, there is great synergy between all the platforms, each leveraging the other – the games – old and new- bring in new enthusiasts and fuel the consumer products and content businesses and vice versa. Bird codes on merchandise and promotional materials, for example, unlocked bonuses in the game bridging the digital physical device (We did this very successfully in India by the Angry Birds Kurkure promotion that had Bird Codes allowing players to power up to the next level). Fourth, there is constant action, keeping fans involved and engaged – be it new games, new content, new forms of business like publishing, to new IPs like Hatchlings, to Location Based Entertainment partnerships – there is constant investment and regeneration of the brand that keeps it refreshed and relevant for its fans from gaming to consumer products. From a India perspective, Angry Birds continue to be an iconic and “hot” licensing property to be associated with. In fact Angry Birds is a case study in India of breaking the accepted mold of how licensing is done. For a property with zero TV presence back in 2011, it spawned a massive licensing program with more than a dozen categories and 500+ products – a never achieved before feat. The brand has come a long way since and the Angry Birds movie’s box office performance has catapulted it back into the driver’s seat. The movie released across 600+ screens, in English, Hindi and Tamil and apart from its massive box office success in India, it holds a record of sorts, of longer playability in some theatres for 8+ weeks, a first for a animated film and re-iterating its captivating and popularity power in India. It had the top QSR (McDonalds) and FMCG (Cadbury Gems and Kurkure) partners flocking to it for promotional partnerships and most importantly boosted sales for partners beyond targets. On the licensing front, we continue to add depth and width in its Consumer Products line and supporting partners with retail and consumer activations. And in addition, in summer this year, it has hit Indian TV screens with programming on the Discovery Kids channel, coming full circle from the smallest screen to the big screen to the small screen! Angry Birds a big hit with Chandigarh kids! 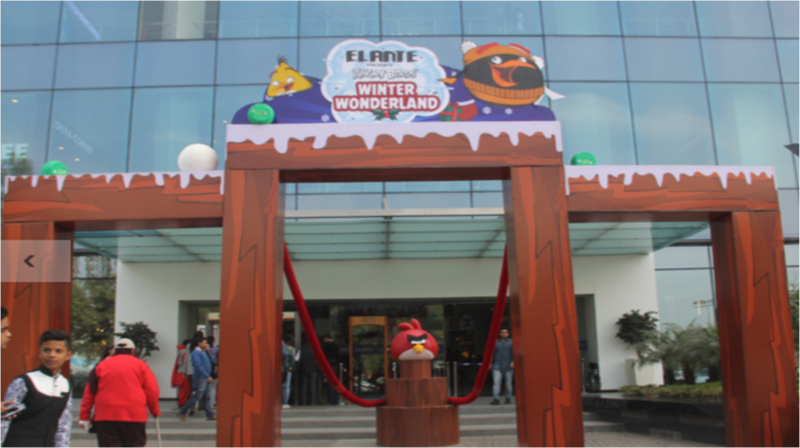 Chandigarh’s biggest retail extravaganza at Elante Mall saw kids arrive in large numbers at the mall to take part in the ‘meet and greet’ session with their favorite stars, the ‘Angry Birds’. 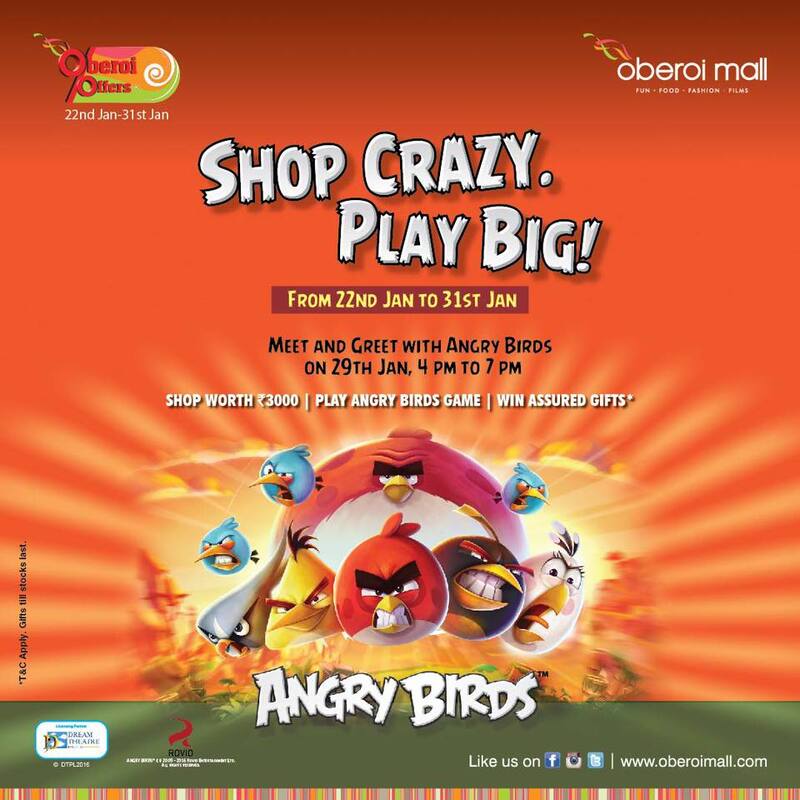 The seven day carnival ringing in the New Year had various Angry Birds activities like ‘Knock out the Pigs’, ‘Target the Pigs’, Color the Birds, Angry Birds Puzzle zone and Angry Birds flash mob. Kids and parents enjoyed every moment of hanging out with their favourite stars, the ‘Angry Birds’ and getting their photos clicked with them for keepsakes. Watch this space for more exciting news for Angry Birds! Angry Birds at Kids-o-fest! Yet another hit with kids and youth! Angry Birds is always the star attraction at events encouraging footfalls and giving everyone an opportunity to experience the brand up-close. 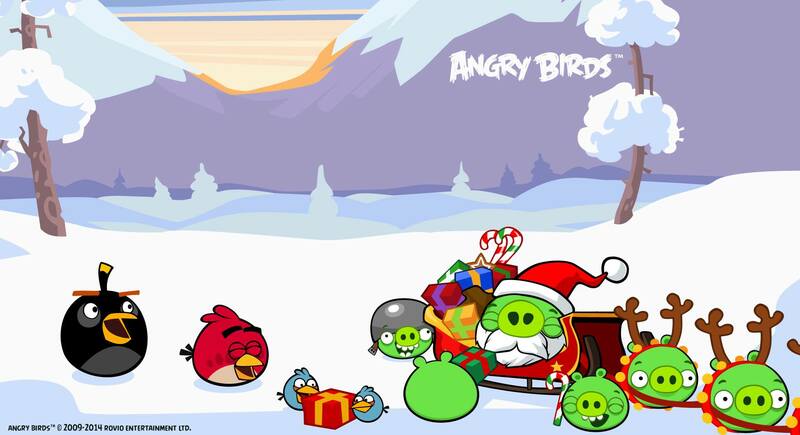 Since Angry Birds inception in December 2009, the game has garnered 2.5 billion downloads globally. One of the most downloaded games of all time, Angry Birds is now coming to life at the Kids-o-fest, East India’s first and biggest kids and Inter School Festival. The fest connects business and brands with school, kids and family. Kids-o-fest was a four-day event organized by Shri Ram Centennial School and Savin Kingdom, commenced from December 18th to 1st. The fest was held at Savin Kingdom in Dagapur where an inter-school fest called ‘Blitzkrieg 2014’ was also held. Students from more than 200 schools in and around Siliguri had come participate in the event. “Angry Birds is the first class example of how popularity of digital properties and games is transcending demographics and geographies. We are delighted to bring both these superbly popular properties to their fans in Siliguri to engage with and enjoy”, said Jiggy George founder and CEO of Dream Theatre, an entertainment, sports, fashion licensing and brand management firm. Dream Theatre, which has licensing rights for Angry Birds, has launched products across 14 categories, including toys, board games, apparel and stationery. 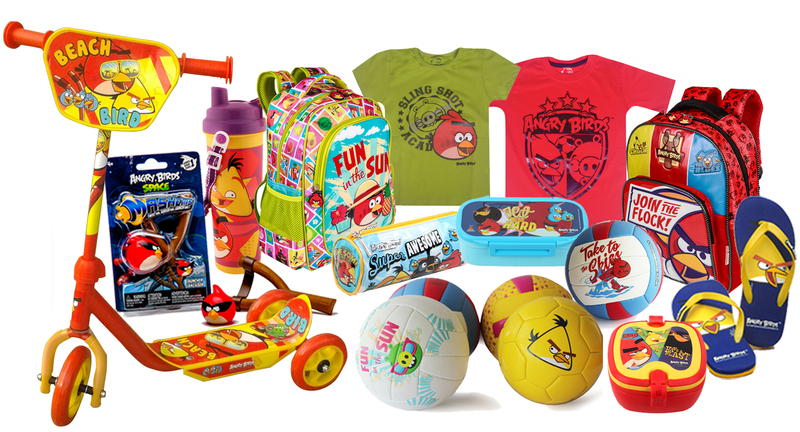 Angry Birds’ branded products are now available across 1,500 stores besides multiple online platforms. Dream theatre wishes everyone a very Happy and a prosperous Diwali. New artwork and India specific style guide created by Rovio. Is Angry Birds a fad that has passed its glory in India? India’s licensing fraternity is infamous for pronouncing a verdict without checking the veracity. Part of the problem is the fragmented retail and the other part is our rather short term view of things. The Trade which is predominantly “Mom and Pop “retail are always looking for something new. To believe that any property/brand can work over decades as an evergreen is certainly a “No”. It’s against the fabric of variety. To add to this, in both organized retail and scattered trade; there are a lot of decision makers who conclude on a property basis of a sample size of one or two. So, if my child or nephew/niece don’t like a property: well, then it surely does not work across India. I have sales team that have waited patiently while a client calls his kids at home, hoping that she loves what we are selling. It’s hilarious for many and frustrating to others. Well, to me, the problem with Angry Birds is the amazing success. I call it a problem as unlike most brands built through the traditional machinery of TV; Angry Birds came out of the digital world. A game taking the big names in licensing to the cleaners had to be seen as a fad. How else would we be able to explain it successful? In India, Angry birds unprecedented success was built on transference: a MalcolmGlad well kind of tipping point. Lots of products mushroomed in neighboring markets and our very enterprising entrepreneurs put them in bags and containers and brought them into India. Suddenly, the Red bird was omnipresent. We at Dream Theatre were a year late in launching the products and we now have over 800 products in 15 odd categories. So, why is the angry bird’s success a problem? The superstar birds made an appearance at World Children Expo and the excitement of the consumers was palpable. The fans completely loved them and the show attracted more crowds and excitement than most of the brands that made an appearance. There are more games in the anvil and everyone is awaiting the movie coming up in 2016. We are awaiting the second coming of the brand. Make no mistake; the second coming in India is just a matter of scale to move from 70 to 100 and not from zero to 100. Squack Squack! Watch this space. The Angry birds are currently preparing for their longest airplane ride! This is thanks to an innovative partnership with Finnair! Finair will fly the world- famous Angry Birds, developed by the Finnish company Rovio, to Singapore. During the flight, fans of the mobile device game will compete in the Angry Birds Asian Challenge at an altitude of 10 kilometres. Tweets detailing the swish of the wings and the demise of the pigs will be sent from the flight. It will be possible to follow the events in real time. Check this video on the flight design.